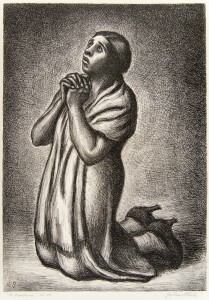 Julius Bloch, The Mourner, 20th Century, Lithograph. Gift of Benjamin D. Bernstein; Collection of La Salle University Art Museum. This exhibition will feature 13 original drawings and prints by Julius Bloch. Julius Bloch was a prominent Jewish, German-born artist who immigrated to Philadelphia with his family in 1893. He studied at the Pennsylvania Museum and School (now known as the University of the Arts.) He became an important social realist artist known for his sympathetic depictions of working class people, particularly African American men. During the Great Depression, he worked for the Federal Art Project and received national attention for his portrayals of poor and oppressed groups of people. He became an instructor at PAFA in 1948. His work has been featured in numerous exhibitions, including a major retrospective at the Philadelphia Museum of Art in 1983. The Julius Bloch exhibition is presented in partnership with The Print Center 100. Supporters of the exhibitions and related programs include the Philadelphia Cultural Fund; the Pennsylvania Council on the Arts; the Brother Daniel Burke Endowment Fund; the Art Angels; and La Salle University’s Departments of Fine Arts, Social Work, American Studies, the Multicultural and International Center, the Greater Philadelphia Initiative, and the Explorer Connection. Opening Reception on Wednesday, September 30, 5:00 – 7:00pm. Friday, November 13, 1-2 pm, “Ennobling Working People: Julius Bloch and New Deal Art”, a public lecture by Dr. Sharon Musher, Associate Professor of History, Stockton University.